Let me first say that I Did Not take this photo. Or the one below either. Hugh Morton did. Hugh Morton passed away yesterday. Mr. Morton is a famous North Carolinian who championed the preservation of the Tarheel State's scenic beauty through his photography . It helped that he owned a mountain as grand as Grandfather. I once heard Hugh Morton say that this photo of the hummingbird flirting with a bee balm blossom was the image of which he was most proud. We were at a Boone Chamber function and he was presenting a slide show of photography. The crowd like it, but they seemed more impressed by his blazing autumnal vistas. I believe that I was perhaps the only person in the room who understood the effort and patience that was necessary for Mr. Morton to capture this fleeting moment. I guess it is one of those 'photographer things' but sometimes it is the story behind the photo that makes an image that much sweeter to those of us who press the shutter. 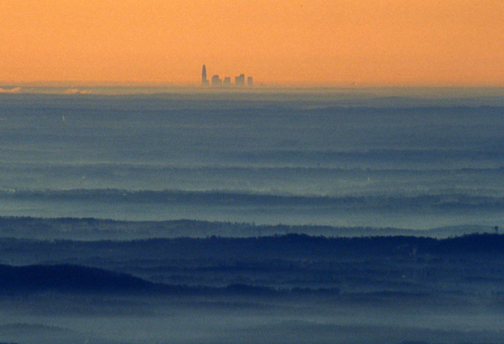 I was attending a camera clinic up at the Grandfather Mountain Nature Center and heard Hugh Morton talk about how he captured the image of the Charlotte skyline from the top of the mountain. He said that it was an unusually clear, unpolluted morning and one of his employees called him on the phone and told him that he thought he could see Charlotte. Hugh grabbed his camera gear and headed up top. I can't remember the focal length of the lens he used, but it was massive and he also had to use a tele-extender to reach the city. A print of this scene hangs in the Nature Center and I return to view it every single time I visit. I'll always remember Hugh Morton as a photographer's photographer. He understood the needs of a working photojournalist and went out of his way to make the job easier for us. Hugh Morton was a visionary who possessed a God given talent for capturing the soul of our North Carolina mountains on film and then promoting their beauty throughout the land. Rest in peace, Hugh. Your life's portfolio shows, without a shadow of doubt, that you were proud to call North Carolina home.